When my double Great-Grandfather Robert Wilhelm Guenther left Appomattox and then his mustering-out as a Union soldier in June 1865, he accomplished the greatest feat of his four-year “career” — he survived. So many of his comrades did not — in the First and Second Battles of Bull Run, the defense of Washington, D.C., Chancellorsville, Gettysburg and other fights for the independent light and heavy artillery of the three New York State regiments records seem to have Robert serving in, 1861-1865. Except for an uncle — Winfield — who lost three fingers in the Battle of the Huertgen Forest in World War II, my direct line of Gunthers has not suffered harm or the ultimate sacrifice in any war since the family left Prussia about 1850. That means we do not have that certain mourning so deep within, especially on Memorial Day. I — we in the family — can and do show added respect on Veterans Day for Uncle Winnie, yes, but the true Memorial Day has been left to those Spring Valley, N.Y., and other families we grew up with whose thoughts surely moved away from the annual parades, the flags, the political speeches, the decorated bicycles kids used to ride. We have all seen the gold stars moms and dads hung in their front windows when a child — and the grownup is always a child, even in death in war — does not ever, ever, come home. But back in the heart he (she) is, tucked in emotionally even if the physical can never happen again in that upstairs bedroom. We all know that no mother ever feels the same again, no father, no sibling. Communities may regain their daily rhythm. World War II and other honor rolls may be removed and permanent memorials placed in public parks. New young are born, parents pass on, the village changes. There are more Memorial Day parades, and, sadly, more mothers, especially mothers whose pangs of loss are as acute, more so actually, than that in childbirth and directly tied, forever now, to that life-altering moment. So, this Memorial Day is not for recalling Civil War or other war survivors. That respect comes on Veterans Day. This is Memorial Day, and we who still stand, we who have no family connection to ultimate sacrifice, must find a moment of silence before the barbecue is lit, the pool attacked, the time off from work happens. A shiny new hotel has opened in Nyack, N.Y., a Hudson River village that for decades was the work home of newspaper stiffs like me. I hope The Time Nyack enjoys success, but I wish today’s media had added color to press reports of its opening. Though Nyack now has three hotels/motels — The Time, the West Gate Inn and Super 8 Nyack — it once boasted the St. George on Burd Street, up just a bit from the docks and the ferry to Tarrytown. The longtime hotel, one of a number in what was once a summer resort town, was next to one of the homes of the Nyack Evening Journal, precursor of the original Journal-News in Rockland County, N.Y., for which I toiled 1964-2006, and catacorner to The Nyack Star, an early 1900s competitor. Therein lie many of the stories born of the old St. George. Once there was a ritual in newspapers that brought scribes, compositors, printers, editors, photogs, even the lowly copy boys who often later proved the genius of the profession to the brass rail for a drink or two or maybe too much. Long before the Hi-Ho tavern offered “high mass” after deadline for we stiffs, often at no or little cost, there was the St. George. You didn’t have far to go from the office. Competing newspapermen and women shared war stories (there are tales like that even in the sticks). These ink-stained wretches also likely explained the plots of the novels most of them were meaning to write but never would. An assortment of Damon Runyonesque characters, not unlike those at Dorothy Parker’s famed Algonquin Round Table in 1920s New York City, would hit the bar at the St. George over its many decades, especially in the 1900s until about 1940. Two such people were Charlie MacArthur, Helen Hayes’ husband, who lived up on Broadway, and Ben Hecht, his fellow Chicago newspaper pal from Upper Nyack. These two had already written the bible play of the profession — “The Front Page” (1928) — and staged the Broadway production (later there were famous movie versions) at the old Nyack Women’s Institute, now part of Nyack College. Pals forged in the brotherhood of the street beat, they bought houses not far from one another in MacArthur’s hometown and now lie for eternity at Oak Hill Cemetery. One can only guess at their many conversations off the St. George rail. At least one president slept at the St. George, and it was the stepping-off point for local Suffragettes lobbying Albany. During World War I, before American entry, part of the St. George hosted a passport factory and spy ring for the Germans, according to a piece by John Patrick Schutz in the January 2, 2011, online Nyack News&Views. Wonder if any of my fellow ink-stained wretches picked up on that story, or were the drinks too many? When I walk in Nyack these days, I am always pulled to Burd Street, to the echoes of the St. George, as much as I am to 53 Hudson Ave, where the great presses churned at deadline in the birth of another daily edition. Lucky stiffs, we. The writer is a retired newspaperman who can be reached via ahgunther@hotmail.com. This essay may be reproduced. Weiden, Germany — On a recent walk here in the centuries-old farmland of this Bavarian region while visiting family, I came upon a war memorial, a bit worn and not as cared for as when it was dedicated perhaps 20 years ago. Such remembrances often suffer that fate because life moves on, and the “now” is for the living. Every town in every nation has a war memorial, if only in the books of the churches, synagogues, mosques or in family Bibles. Somehow, lists are made, notations entered, prayers said, heads bowed, and then daily tasks take over. Life moves on. And it has in Weiden, a small, prosperous community in prosperous Bavaria, not far from Munich or the large World War II Wehrmacht and First World War Bavarian Army training bases, some held — still — by the U.S. military. Neatly kept homes surround the platz or town square with its ancient buildings, people go about their work matter-of-factly, and there is a hum that contents. Residents enjoy strolling in the square, shopping, eating. The sounds of war are so very distant now, and generations are removed from its horror. Who can argue against that? Certainly the war dead would have wanted such living, having sacrificed for it. Yet on my quiet walk, which is the best walk, passing winter straw in fields just like those in my boyhood in Rockland County, N.Y., listening for the freight train so easily heard in the stillness, looking at barns that survived bombing, the Weiden war memorial seemed at once out of place. It seemed an intrusion in that bucolic scene. But quick quilt took over, and I walked to a block of stone on which appeared the names of the men — young mostly — of Der Erste Weltkrieg (First World War). I read the many names with reverence, as you must do, and then looked at an even bigger column of names from the Der Zweite Weltkrieg, the second world war. It was then that I stood without any movement, for a very long moment. I stared at one family name, a family which had lost three men in 1914-1918 and then seven in 1939-1945. Ten gone. One family. Walking back to my son’s temporary home in Weiden (his wife is a U.S. Army physician posted to the base at Grafenwohr), I glanced at a very old farmstead and wondered if one of those first three German men had dressed field horses with plowing harness or had wrestled with each other in the hay. Did their fathers or sons or uncles do the same just before 1939? Had any of them seen the winter straw or heard the far-off train whistles in those quiet moments of boyhood? And in America, in any small town, in Rockland County, in France, England, Allied nations, Axis countries, did those young people whose names now stand out on war memorials do any of the things you do in peaceful times? And what of the civilian casualties, especially those in the Holocaust? Even if people once in our lives have left us or we them, or if circumstances — changes — took them away, there is certainty in familiar shadows, a feeling more than apparition actually, that besides you is the person long gone. You may be walking down a childhood street where you haven’t been for quite a while, looking at old, tan-colored sidewalks you are sure you trod, as did your parents, grandparents, friends, classmates, so many others. If you are not on the smartphone and perhaps just a little bit into a daydream, you will see her, or him or them on those sidewalks — familiar shadows. Perhaps you then have a chuckle or a recalled conversation or the faint memory of a happening way back. Nice visit. Maybe you are in a public building — a theater — or on a playing field, and you glance up at the scoreboard or screen and remember a familiar place and its people. In that instant, decades can be removed, and you can almost hear the sounds of that time, smell it, feel it and recall those you knew. Familiar shadows come to us in dreams, of course, almost as when you lived with those people. Old banter, even argument, certainly feelings can take place as if the subconscious was the real deal, not waking life. You can be talking to someone today, when, without tip-off, a familiar person appears in thought or as shadow on that part of that particular couch. Surely in our increasingly busy lives when sound bites and word bites are the staccato background for multiple tasking, there isn’t much time to chill, to hang out with familiar shadows. But here’s the thing: Sometimes they don’t give you a choice, and they just pull you away. Such moments can be heartwarming, reaffirming. The writer is a retired newspaperman who can be reached at ahgunther@hotmail.com As always, this essay may be reproduced. Rose Queen of Hale, Leoni Topping with consort Denby. Here we view many pretty women, such as the “Queen of Long Itchington, Elisha Thorne Bowmaster,” a carnival royal in 2014 with crown, the British flag and gay balloons. There is “The Coronation of Queen Aimee Bridgett of Newark,” who rides in a float. 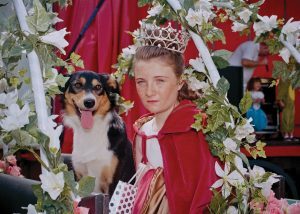 And “May Princess of Skegby, Jasmine Hannant,” representing a village where residents have organized a fair to re-ignite lost community spirit. There are 100 well-shot, un-posed images in fine reproduction in this book, with locations such as Sutton on Sea in Lincolnshire, Northamptonshire, Kent, Essex and Greater London. The book is already in the British Library and is sure to be future reference since it documents disappearing tradition and related charity. When you look at the images of these women, children and some men in Barber’s book, you will not see the proclaimed English royalty, no more than traveling across America will you meet just the rich and powerful. The essence of a democracy is in its people, its truly ordinary folk who are actually extraordinary in their existence. Si Barber has chosen to celebrate the real value of the Magna Carta, its evolved “intent,” by hailing English county tradition. Long live the queens and kings of that realm!